Andy Roddick has joined the list of commitments to play in the Winston-Salem Open at Wake Forest University Aug. 20-27, tournament director Bill Oakes announced today. 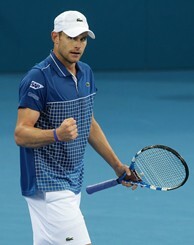 Roddick, a former World No. 1 who is currently No. 12 in the South African Airways ATP rankings, will receive one of the tournament’s four wildcard entries. "We are extremely pleased that Andy has decided to come back to Winston-Salem, where he has had so much success in the past playing for the United States in the Davis Cup," Oakes said. "His addition gives the tournament all the top American players and makes an already-strong field even stronger." "It’s very important to note that Andy has never competed in a tournament the week prior to the U.S. Open throughout his entire professional career," Oakes added. "So, it’s very significant that he made the commitment to play in the Winston-Salem Open, given the timing of our tournament just before the U.S. Open." Roddick joins fellow Americans Mardy Fish, John Isner, Sam Querrey, Ryan Harrison and Donald Young in the 48-player singles draw. All told, 10 of the top 40 players in the latest South African Airways ATP rankings have committed. Other entrants include Jurgen Melzer, Bernard Tomic, Kevin Anderson, Marcos Baghdatis, Alexandr Dolgopolov, Nikolay Davydenko, Tommy Robredo and Ernests Gulbis, the winner last week in Los Angeles. Roddick, 28, has won at least one ATP World Tour singles titles in each of the last 11 years. He won earlier this year in Memphis. He has won 30 career ATP World Tour singles titles, including the 2003 US Open title. He won six tournaments in 2003, five in 2005. He also has 20 runner-up finishes in his career, including four Grand Slams. Three times he has been the runner-up at Wimbledon – 2004, 2005 and 2009. All three times he lost in the finals to Roger Federer; Federer’s 5-7, 7-6 (6), 7-6 (5), 3-6, 16-14 victory in 2009 was perhaps Roddick’s most-heartbreaking defeat. Roddick’s stay at No. 1 in the South African Airways ATP rankings lasted from March of 2003 through December of 2003. He also has a 33-12 record in Davis Cup singles, including a perfect 5-0 record in Davis Cup matches in Winston-Salem. In his debut as the U.S.’s No. 1 player in 2001, at age 19, he won two singles rubbers as the U.S. beat India in a World Group Qualifier at Joel Coliseum. In 2007, he won his opening match to pave the way for the U.S.’s much-hyped quarterfinal victory against Spain, which propelled the U.S. on to the Davis Cup championship. Then in 2008, he tacked on two more singles wins in a quarterfinal victory against France. Roddick also played in the Flow Motors Invitational before turning professional. The Winston-Salem Open, an ATP World Tour 250 event with a total purse of $625,000, will take place from August 21-27, 2011, with qualifying set for August 19 and August 20. The tournament will be the final men’s event of the Olympus US Open Series. The tournament will receive national television exposure via Tennis Channel and ESPN2, including the singles final broadcasted by CBS. The Winston-Salem Open offers a text update program to keep fans informed about the tournament. To enroll in the free service, text WINSTON to 55333. For more information or to purchase tickets to the Winston-Salem Open, please go to www.winstonsalemopen.com. The Olympus US Open Series has established itself as a true regular season of hard court tennis, linking 10 summer tournaments to the US Open. Fans follow the action throughout the summer through national television coverage, culminating each week with back-to-back men’s and women’s finals on Sunday afternoon. Players battle for $40 million, including a chance for bonus prize money at the US Open. In 2008, Olympus became the first title sponsor of the Series. The Olympus US Open Series is also supported by sponsors American Express and Evian. Andy Murray won the 2010 Olympus US Open Series men’s title and Caroline Wozniacki won the women’s title. In 2007, Roger Federer collected the biggest paycheck in tennis history – $2.4 million – for winning the US Open and the Olympus US Open Series. In 2005, Kim Clijsters also captured both the US Open and the Series, winning $2.2 million – the largest purse in women’s sports history – and again equaled that amount in 2010, winning the US Open and finishing the Olympus US Open Series in second place. The ATP is the governing body of the men’s professional tennis circuits – the ATP World Tour, the ATP Challenger Tour and the ATP Champions Tour. With 62 tournaments in 32 countries, the ATP World Tour showcases the finest male athletes competing in the world’s most exciting venues. From Australia to Europe and the Americas to Asia, the stars of the ATP World Tour battle for prestigious titles and South African Airways 2011 ATP Rankings points at Grand Slams (non ATP events), ATP World Tour Masters 1000, ATP World Tour 500 and ATP World Tour 250 events. At the end of the season, only the world’s top 8 ranked men’s singles players and top 8 doubles teams, based on their performance throughout the year, will qualify to compete for the last title of the season at the Barclays ATP World Tour Finals. Held at The O2 in London, the event will officially crown the 2011 ATP World Tour No.1 in singles and doubles. For more information, please visit www.ATPWorldTour.com.